There is nothing quite so evil as the smile on a player’s face when he throws the doubling cube at his opponent. Except the cube itself. But the cube is more: it is also a lethal weapon, and it should be used as such. To be specific, it can often achieve its goal by threatening or bluffing the victim into submission. Very simply, the cube is designed to persuade your opponent of the righteousness of your cause, which is to make money. Help with this purpose is what I’ll try to give you here. Successful use of the doubling cube serves several other purposes in addition to the basic desire of winning money: it forgoes the necessity of playing out a probably dull game, and, more importantly, it also precludes both possibilities of his getting fantastically good dice or your getting fantastically bad ones, either resulting in the unfortunate situation of your losing the game. It is this possibility of losing the game you have unhappily doubled that brings us to a fascinating absurdity of the cube, which I’d like to point out here, for it affects your decision in whether or not to accept the cube. Simply put (and for the moment not considering gammons or backgammons), the cube doubles the net game for the one using it but, in effect, triples the potential winnings for the opponent who accepts it. It is apparent that the person throwing the cube can win or lose two dollars if the game is played out, rather than the initial stake of one dollar (which is what we’ll assume the basic bet to be to illustrate this discussion). He has merely doubled the bet and the amount that he can win or lose. Paradoxically, however, the player who accepts the cube is not similarly doubling his bet. For him, it is different — and better. Since you have no choice about the cube’s being thrown at you, when it is you then have only the two options open: either pay the dollar or gamble another dollar on the chance of winning. That is, give up, and pay one; play on, and you may have to pay two. Therefore, at this point your actual gamble is only one dollar, because you have no choice about the first dollar: it must be paid in either event. However, for this gamble of an additional dollar, should you win you not only collect the two-dollar stake from your opponent, but you also save the dollar you otherwise would have paid — a net gain to you, therefore, of three dollars. So, by accepting the cube, you are accepting odds of 3 to 1, a much more advantageous take than the seemingly obvious — but incorrect — odds of 2 to 1. These odds of 3 to 1, incidentally, apply no matter what number the cube is on when it is thrown. This is not sophistry; it is simple mathematics. If you accepted the cube and were then gammoned, don’t fret. It happens to all of us. But if it happens to you often, you probably should more carefully examine your practice of accepting doubles. Maybe you’re being foolhardy, confusing it with bravery; maybe you’re not analyzing your position accurately enough. As for the odds involved: if you accepted the cube, lost a gammon, and now have to pay four dollars, you actually lost an equal-odds bet. That is, if you had not accepted the cube, you would have lost — and paid — one dollar. So, you actually lost three more, and since you had the opportunity of winning at least a net of three dollars (assuming you did not gammon your opponent), the real odds for you were 3 to 3, or even. If you were backgammoned, it was a 5 to 3 gamble. The elementary rule of the cube is to use it only if and when you have a distinct advantage over your opponent. By this I mean that your game must be sufficiently strong so that, unless your opponent suddenly gets fantastic dice, you are at least reasonably sure of beating him. I do not say “a very good chance of beating him,” for I want to make a distinction. It seems to me that if you have a very good chance of winning, you have a pretty good chance for a gammon. In this event, you may not want to throw the cube too soon; you may prefer to wait. If your game gets even stronger, fine. But if it should start to slacken off, you presumably are still in a strong enough position to throw the cube and force him out. However, I happen to believe that in general one wins when one can: that is, one dollar won is better than two that may be lost. Therefore, when I believe that my opponent will not accept the cube, I double. I don’t want him to accept, ever. As far as I’m concerned, the cube is not a doubling tool; it is primarily a weapon with which I expect to force my opponent out of the game. I always want him to refuse, for I distrust and fear the fickleness of the dice. Therefore, I will usually take the game when I can and not be greedy, because greed — like any hubris — can be my downfall. In general, I do not throw the cube when I think he will accept it, unless I am quite confident of winning the game. This leads to the matter of behavior pattern of your opponent. Some people accept the cube almost invariably; against such a player I handle it in just that fashion. With him, I wait. I wait until I am virtually certain that I will win at least the game if not a gammon; then I throw the cube. If my opponent follows his pattern, he will accept, and then I will win double the bet at relatively no gamble. Should I gammon him, it’s like strawberries in the winter! Yet another advantage against such a player is that if my game suddenly goes sour before I throw the cube, I am saved the possible resulting embarrassment of losing a double game. Other players crumble at the sight of the cube. They sit there, staring at the board, then at you, looking somewhat like a betrayed basset hound. Finally, the sigh and the capitulation. This is what is known as an easy mark, and you don’t need any advice about playing against him. Just keep throwing the cube and collecting. If your opponent is not one who crumbles too easily, however, but is a reasonably good player and appraiser of his situation, it is wise not to double too early. Even a strong advantage can quickly evaporate. Suddenly you’re redoubled, and it’s disaster time. Against such a player, I wait. An apparent advantage early in the game is often only that: apparent. And a good player knows this, so he will usually — and especially if he also knows the 3 to 1 odds situation I talked about earlier — accept such a double. But if your strength remains, you can always double later in the game, when there is less time remaining for the vagaries of war to shift to his favor. Or, if your early strength turns to real power, you might then prefer not to double but instead go for the gammon. This, then, is the first rule of the cube: don’t double too early. There are certain factors to look for before throwing the double when there is still contact between you. By “contact,” I mean that it is a mid-game situation where you each have men to still get past some of the opponent’s men; the matter of doubling once there is no longer any contact is treated later. You should have two or three of his men — not four — bottled up in your inner board. You should have a strong blocking position of at least four or five points covered, preferably in sequence. You should not have more than one of your men in the comparable situation of being bottled up in his inner board. You should be further advanced than he is in your forward game by at least the value of two or three throws. Finally, and most importantly, your opponent should not be in a good position to go into a back game. It is this last point that is vital: how strong are his chances in a back game? If the possibility exists that he can go into a good one, and especially if he is a sophisticated player who understands it, don’t double! In this case, it would be wise to wait for another few throws and see what develops. Practically, this is the second rule of the cube: when you are further advanced than your opponent, and he no longer has a chance for a good back game, double. The reverse also applies, of course, when the cube is thrown at you. Assuming the above factors are present for your opponent, and unless you feel fairly confident that you will be able to go into at least a respectable back game, you should not accept such a double. To do so is to invite disaster. Indeed, I find that the hardest decision I ever have to make is not when to throw the cube, but rather when not to accept it. It’s easy to throw it; it’s easy to accept it. But it is hard to refuse! For me, as for most people, it’s partly bravado, masquerading as bravery, especially if a pretty girl is watching. But it’s probably even more the nature of the beast: if I was not a gambler, really enjoying the game and the excitement that a revolving cube may bring, I wouldn’t be here. I tend to gamble all the way, which makes me an easy mark, at least in this regard. So are most players: we accept foolish doubles, hoping for — and somewhat expecting as our due — the miracle toss. But the unfortunate truth is that this toss just doesn’t occur often enough. And, of course, it can happen for my opponent just as readily as it can for me; if it does, a gammon, doubled and accepted, can be a true disgrace. The decision to accept the cube should be based on only one question: how good is your chance of winning? It should not — it must not — be based on any other factor. The amount the game is worth at that moment is immaterial; the amount that you are winning — or, especially, losing — at that moment is immaterial; the hour of the night is immaterial. All that should affect your decision is the probability of losing versus the possibility of winning. You cannot depend on lucky dice; you cannot — if you have been losing money — accept doubles in an attempt to win it back faster; you should not entertain the thought of making it a more exciting evening because it is beginning to draw to a close. Take the cool, hard-headed businessman’s approach to the cube before throwing it or accepting it: what are the realistic chances of its making money for you? I say “realistic chance,” for every once in a while I, like you, take unrealistic ones. The probabilities dictate one course of action; I sometimes take the risk of the other. I’m a gambler, so I rationalize this by saying I hear the dice, or I just felt that I should, or some other such nonsense. If it pays off, I can play the big hero; more often, I’m the fool. But to win consistently, which is what this book is about, keep the risk element to a minimum and play the odds. The biggest gulp is when the cube is already at eight or sixteen, say, and is thrown back at you. There is a tendency to accept it because you don’t want to give up that big a game. Resist the tendency. The merits or non-merits of accepting the cube are not related to the size of the bet; if anything, the tendency should be in the other direction. It is far better to lose one eight-point game and be able to play again than to lose (in effect) two eight-point games; that’s even more demoralizing. Accept the cube if you feel you have a proper basis for doing so; refuse it if you don’t. But don’t allow the number showing on the cube to influence your decision in any way. It’s either a good take or a bad take; doubling it only makes it better or worse, not different. In this regard, beware the allure of accepting a large double just because you are losing and are hopeful of winning it back in big chunks. This hope that springs eternal in every gambler’s breast is really nothing but a tempting mirage. Almost invariably, you will wind up multiplying both your losings and your self-hatred for having been such a fool. For if the dice have been going against you, you have to bet cautiously until they change; if in fact your opponent is a better player, your playing for higher stakes will only increase your losses. Of course, there are times when you feel that it’s on the borderline of being a good take or not. Whenever I’m so undecided, I generally accept the cube. This is especially true when I’m winning, for as a famous gambler used to say, bet the sky when it’s the other fellow’s money, but play it close when it’s your own. There’s a certain validity to this, and so I tend to take these questionable doubles. My thinking is that since I have been winning thus far the combination of my luck and my strategy may continue. And should I in fact win such a game, my opponent will be even further demoralized. But even so, I do not take an obviously bad double. The principle remains the same, and should really be our third rule: accept the cube only if you feel you have a legitimate basis for doing so; have the courage to refuse it when you recognize realistically you have an inferior game. There are other reasons which you should consider for accepting the cube in a borderline situation. First, there is the matter of odds, which I discussed earlier: a 3-to-1 gamble is not bad when your opponent is not that strong. Second, the cube is then in your possession. And, if in this instance it isn’t a clear-cut case to refuse the double, it isn’t too likely that you will be gammoned. However, there is now the assurance that you can play the game out to the end, with the possibility that right will overcome all adversity and you may yet gain the advantage. Should this happen, it obviously is of great value for you to have control of the pressure the cube can bring to bear. In this regard, it is wise to keep the cube where it can be easily seen, so that you remain aware of it. I always keep it on the bar in front of me, rather than off to the side. Although there is an awkwardness to this — from time to time it gets knocked off, and has to be replaced — this positioning is crucial to keeping it constantly in mind. I have seen people so engrossed in their game that they completely forget the cube — and the right moment to throw it, like luck or love, is often fleeting. Keep it where you will see it; constantly be aware of it. That’s rule number four. Let’s get into the use of the cube when there is no longer any contact. 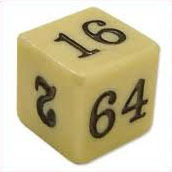 Here the situation is one of a mere race, and the use of the cube when you are somewhat ahead is to force out your opponent, in order to avoid the possible fickleness of the dice. In this situation, your conduct depends to a great extent on the courage and behavior pattern of your opponent in accepting the cube. If he generally accepts it, then you want to wait until you are fairly sure of the game. If he generally refuses it, you can throw it sooner. In the latter case, the question I would ask is why you have waited this long to throw it; you probably should have done so much earlier. In making the decision to throw (or accept) the cube, no consideration need be given to the matter of gammons, since it is evident that both players will be able to avoid that danger if they play out a non-contact game. It is your throw, and you have men on your 2 and 5 points. Your opponent, with men on his 1 and 2 points, will get off on his next throw, as there is nothing he can roll that will not allow him to take both men off. Should you double? Yes, say I: if he accepts, you have more than an even chance to win double the bet. If he doesn’t accept it, great: you have your money. So, when I have this board, or a better one, I always throw the cube. If my opponent has a 2 and 5 position and throws the cube at me, do I take? Well, I do if it is exactly a 2 and 5 position that he has, and also if my position is at least 2 and 5 as well. The reason is this: although he has better than a 50–50 chance of winning, there is still the factor of 3 to 1 odds working for me. So, although there are nineteen ways out of thirty-six for me to lose one dollar, there are seventeen ways out of thirty-six for me to stay alive and then have at least a 50–50 chance to win three. Therefore, the odds paradoxically are with me to accept. If he is even one point better for either of his men, I generally don’t take the double. Why? Because with either a 1 and 5 position or a 2 and 4 position he has twenty-three out of thirty-six ways of getting off. Here, it’s not worth my taking the chance, and so I refuse the cube, pay the dollar, and hate him even more! So, rule five: remember 2-5 to throw the cube; accept it with your 2-5 unless he’s even one point better. Now, since the dice have no memory and there is no reason to expect your second throw to have other probabilities than the first, the same rule holds true when you each have four men left on the board. Indeed, it is even more fun to watch your opponent squirm when he has three men left to your four! You can lose some heartbreakers, as when he gets a double, but the excitement and the probabilities both make it worth your while — if you don’t already have an ulcer to contend with. In bearing off, and with a proper distribution of men, the probability is that eight throws (sixteen dice) are all that is necessary. (Remember, I am talking about a no-contact situation.) Although doubles should occur one and one-third times out of eight throws, since doubles can occur equally for either of you I will disregard them here. And because I desire simplicity and efficiency, I don’t bother counting specifically these necessary eight throws. What I do count is any inequitable distribution of men in terms of additional throws that consequently may be necessary. If as I suggested we disregard doubles, then in thirty throws — that is, with sixty dice — the probability is that each number will show ten times, or one out of six. So, for every six throws — twelve dice — the probability is that each number should show twice. Therefore, I consider it an equitable distribution when I have twelve of my men spread two to a point on the six points, and with no more than one of the other three men on the upper half of my inner board (that is, on the 4, 5, or 6 points). This is because I should throw a 1, 2, or 3 as often as a 4, 5, or 6, and so if more than one man (of these three) is on the upper half of the inner board I cannot count on getting him off in the allotted number of throws. Therefore, for each extra man on points above the 3, I count an additional half throw (one die). I also count an additional half throw for any point that is blank, if there is a higher point that has men on it, for this very often necessitates moving a man within the board. For me, this is the important count — how many additional half throws are necessary for me to bear off, as contrasted to how many my opponent needs. We might call this comparison shopping. I am judging my inner board versus his, and quickly estimating the cost — in terms of the additional number of throws — necessary for each of us to get off. And this evaluation is what determines how I use the cube. Take the board in Diagram 78, for example. I would quickly evaluate this as my being two throws better than Black, and so I would throw the cube at him. I figure it thus: on the lower half of my inner board — the 1, 2, and 3 points — I have four men more than he. But this isn’t as important as the upper half — the 4, 5, and 6 points. Here I have at least a one-throw advantage as far as the 4 point is concerned, we are equal on the 5, and I have a half throw advantage on the 6 point. This, combined with the strength I show on the 1 and 2 points, would prompt me to throw the cube, especially when I take into consideration the fact that I have the dice (otherwise I could not offer the cube) and so, after my throw, I should be three throws ahead! If he takes it, he’s a fool; I wouldn’t take if the positions were reversed. My rule here is that I double when I’m two throws ahead. What to do when I have a closed board — a prime — and he has a man on the bar? Let’s say I have taken off two of my men, with thirteen left to bear off, and the board looks like Diagram 79. Should I double? Well, let’s count it out. I need a minimum of seven throws (again not counting on doubles) to bear off. It may even require eight throws, if I have to make a “safe” move to avoid being hit. As for Black, he will probably require two throws to get in and two more to get this man around to his inner board. He probably will also be able to get both his men on the B11 and B8 points in on one throw. Therefore, the probabilities are that Black will be able to start bearing off on his sixth throw. Consequently, the chances of my getting him on a gammon are not good; against this slight possibility is the larger danger of my having to leave a blot and his hitting it, which could suddenly turn the tables completely. So, in this case, I would throw the cube and hope he refuses it. Here, Black still needs four throws to get his man on the bar into his inner board. But the men on W8 and W9 probably need one and a half throws each, the men on W12 and B11 need on throw each, and the man on B8 needs half a throw. This means a probable total of nine and a half throws before Black can begin bearing off. Therefore, because there is a good chance of a gammon, and because his back game position is virtually non-existent, I would not double. Let’s get to counting from the outer board. Here, the comparison shopping is generally based on the relative number of throws we each need to get into our inner boards and begin bearing off. Obviously, if most of the men being counted are out of the inner board, then the relative positions in it are of little moment. But if the game is fairly advanced, and there are relatively few men outside the inner board, the comparison of the inner boards must be taken into account as well. My decision to throw the cube is based on a simple formula: for every eight throws necessary to win, I want to have at least a two-throw advantage (before my next throw) in order to offer the cube. By this I mean that if I need six throws to get all my men into my inner board, I will not offer the cube unless my opponent seems to need at least eight. And as the number of throws required gets larger, because the game is not that advanced, I wait until my edge gets greater or the game has substantially progressed, since two or three lucky (or unlucky) throws can too easily upset this small advantage. This is especially so against the sophisticated player I mentioned who knows the odds, for he — as I — would generally accept a double in such a situation. I will accept the cube even with a disadvantage of three moves out of eight if it is early in the game. Later, I generally play it by feel. Anyway, this method of counting works. As you get used to it, you can do comparison shopping quickly. And this information, together with your judgment of your opponent’s pattern of behavior, should quickly make back for you the price of this book. There are several other points I’d like to make about doubling. When I throw the cube, as with all of my play, I try to demonstrate a confidence in my act that admits of no self-doubt whatsoever. I make it very plain to my opponent that I know what I’m doing, and that if he takes my double he is at best a fool. And I do the same when I accept a double. Now, this may be only a small edge, and obviously there is no way to measure just how much this rattles and opponent, but I have no question about its overall value, and I recommend it to you. In this respect you should know about beavers. A beaver is rarely used, but if you do use it — and pull it off — you can be sure your opponent will hesitate measurably before throwing the cube at you again. A beaver is a double , and works like this: if your opponent throws the cube at you, and you know he has made a grievous error in doing so, you have the right — if you wish — not only to accept it, but immediately (that is, before he throws) to redouble the stakes. The gimmick is that you retain control of the cube as well! So, assume he throws the cube at you for two; before he throws, you not only accept it but turn it to four! In theory he should be perfectly willing to accept it, since he expected — and was willing to chance — winning two. If he doesn’t take the beaver, he has to pay you the two, for you in effect accepted that double before redoubling. Of course, he will probably take it, but his jaw may hang a little loose. Your attitude, should you lose such a game, is that you almost made it; if you do win it, you’ve really got your friend demoralized for life — and you can now use the cube almost with abandon. As for redoubling, some players suggest that there are times when it is wise to double, but not redouble. This is nonsense. If the time is ripe to double it makes no difference whether the cube is at 2, 4, 8, or whatever. A double is a worthwhile or not worthwhile based only on the status of the game at that moment and the probabilities involved; it is not dependent on where the cube is or how much higher it will go. If it is not worth doubling to 16, it is not worth doing for 2. There is no rule on this; some players do not allow such doubles, others limit them, as I said. But I think that if the dice keep coming up doubles, well, so be it: Keep turning the cube. There is no hustling involved: each man has controlled one die. And so I play the doubles the way the dice dictate. It really helps stimulate the adrenalin, which is what the game is all about anyway. You should also know about settlements. Some players accept settlements; I have never played this way and don’t care to. In effect, it goes something like this: one player says to the other, “The cube is at eight and I’m going to throw it at you for sixteen; since you’re crazy enough to accept it, and since no one knows what might happen with the dice, “I’ll take six now and let it go at that.” His opponent: “Four.” So maybe they settle for five. They sound like used car salesman. There really is no way to evaluate a settlement, and so there are no guidelines; it’s simply a matter of haggling over terms. I have seen people offer settlements when I felt they had an excellent chance of winning, and I was astounded at their insecurity. For that’s what it really is: insecurity on both sides. Neither one feels he is strong enough to win, and so in effect they both give up. If either believed in his position, he wouldn’t settle. And so the only tip I can give you is, if you are confident of your position, don’t settle. But if you feel insecure about the dice, take the money and run when a settlement is offered to you. But for me, settlements diminish the fun and excitement of the game; it’s almost like a tourist suggesting he’ll go only part way up in the Empire State Building if they’ll reduce the price. Therefore, I don’t play with settlements and I don’t recommend them. When you are further advanced than your opponent, and he no longer has a chance for a good back game, double. Have the courage to refuse the cube. Keep the cube where you will see it and constantly be aware of it. When bearing off, remember 2-5 to throw the cube; accept it with your 2-5 unless he’s even one point better. Have at least a 1 in 4 advantage in throws before doubling. And so, if you understand these few rules, you too can play diabolically — and for blood.